This new item launches players great distances without inflicting fall damage. The blast is so strong, you can launch players through structures! All things that glitter are gold! Battle with all legendary weapons in the Solid Gold and Solid Gold 50v50 LTM’s, available now! Fixed an issue on Nintendo Switch that could cause players to be unable to party together. Fixed an issue that could cause the game to loc on certain screens on Nintendo Switch. 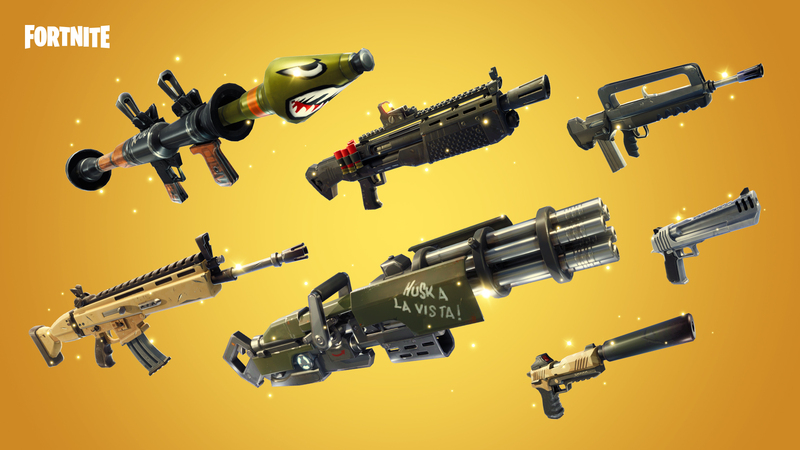 The 50v50 LTM will consist of only legendary weapons and items for a limited time. Drop in and loot up! Shockwave Grenade will knock players back and destroy objects in their path after being knocked back. Allies, enemies, and vehicles hit with Shockwave Grenade will not take fall damage. Drops in stacks of 2, maximum stack size of 6. Can be found in Supply Drops, Vending Machines, Llamas, and chests.